Since you joined Instagram, you spend a lot of time posting photos and videos of the various activities you do in your (little) free time: the shots of the holidays spent with your friends, the dishes that you cook for dinner and many other glimpses of the your private life. Since you want to keep a certain degree of privacy, however, not giving up the sharing of these personal content with your friends and your current followers, you have thought well to make your private Instagram profile. There is only one “small” problem: you are not very familiar with the settings of the famous social photo network and, consequently, you do not know how to put the private profile on Instagram. I guessed? Well, lucky for you, you’ve come to the right place at the right time! 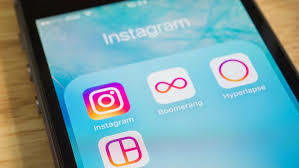 In the following paragraphs, in fact, I will explain to you in detail how to make your private Instagram profile whether you intend to act from an Android device or an iPhone or even a PC. Before entering into the heart of the subject, however, I want to make a proper clarification: by setting your profile as private, only those who approve will be able to see your posts on Instagram. So your current followers will continue to see your posts (unless you block them). If everything is clear up to now and you want to proceed with the privatization of your Instagram profile, we do not waste any more precious time and move on to action. Enjoy the reading! Putting your private profile on Instagram from an Android device is simple: all you have to do is start the official Instagram app, go into its settings and then activate the private account option. Then start the Instagram app on your device by pressing on its icon, log in to your account (if necessary), tap on the symbol of the little man placed at the bottom right and, in the screen that displays, tap the symbol (⋮) located at the top right. 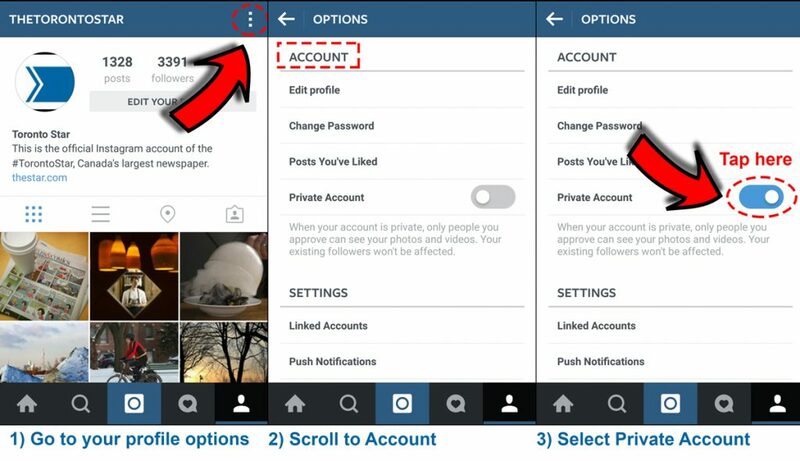 Scroll down, then, the Options screen, locate the Account section in which there is an option to privatize your Instagram account, move the switch ON the switch located in correspondence of the private account and confirm the operation by pressing on OK button in the box that appears. Easier than that ?! As explained by the note placed just under the heading “Private account”, if you set up your private account, only the people you approve will be able to see your posts on Instagram. For your current followers, however, nothing will change. Of course, if you change your mind, you can restore the default setting and return to the public Instagram profile by going back to the Instagram Options screen (you can reach it by pressing the icon on the lower right hand corner and then on the three dots located at the top right) and moving the switch lever located at the Private Account item to OFF. If you want to put the private profile on Instagram from your iPhone, you have to follow more or less the same steps that I have indicated in the chapter dedicated to Android. 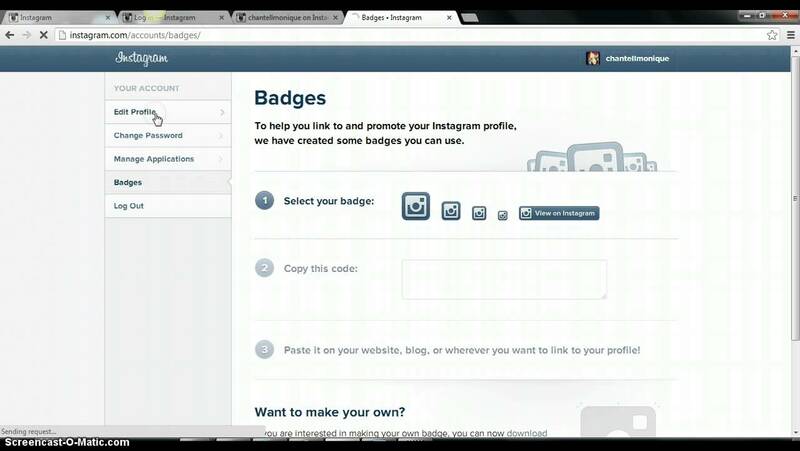 Then start the official Instagram app by tapping its icon on the home screen and log in to your account (if required). Then, presses the symbol of the man placed at the bottom right (or on the thumbnail of your photo, always placed at the bottom right) and, in the screen that displays, tap the symbol (…) located at the top right. At this point, scroll down the Options screen and locate the Account section containing the option by which you can privatize your Instagram profile. Then move the switch lever located next to the Private account item to ON. 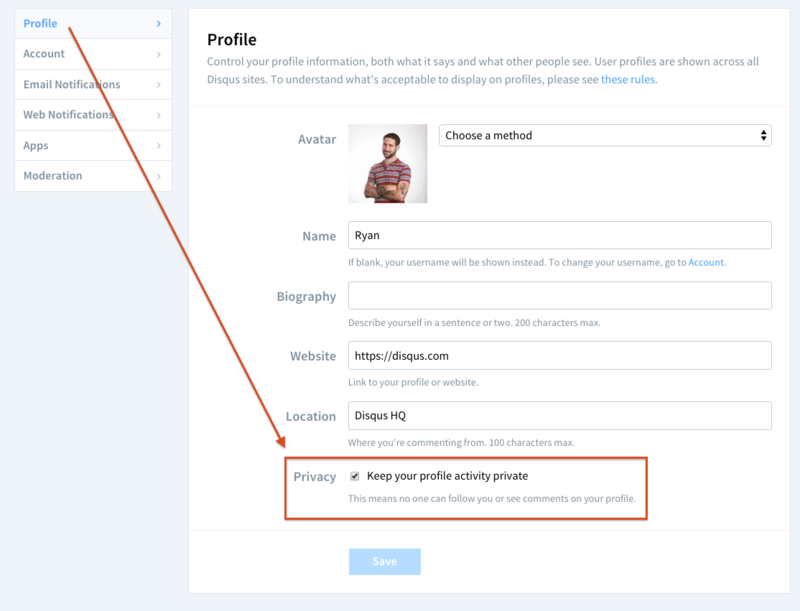 As indicated by the note located just under the heading “Private account”, by setting your account as private, only the people you approve can see your posts on Instagram. Your current followers, however, will not be affected by the change just made to your account. Of course, if you decide to make your Instagram profile public again, you can retrace your steps at any time. To do so, simply go to the Instagram Options screen (reachable by pressing the icon on the lower right hand corner and then on the three dots located at the top right) and then moving the switch lever located at the Private Account entry. If you want, you can also use the Web version of Instagram, the one accessible from a PC via a browser, to set up your account as private. 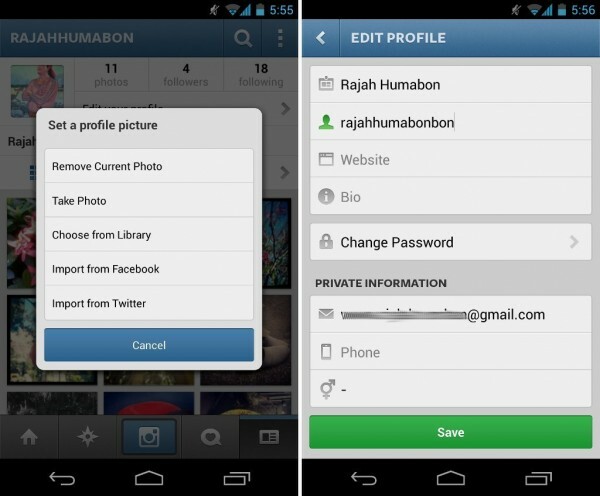 Then connect to the login page to Instagram from the browser, log in to your account (if required), click on the icon of the little man (located at the top right), click on the button Edit the profile placed next to your username and, on the page that opens, check the box located next to the Private account entry (at the bottom of the page). If you want to go back to having a public Instagram profile, click on the icon again, then on the Edit profile button, uncheck the Private account and confirm the operation by clicking on the OK button in the box that appears. If you have a Windows 10 PC and have installed the Instagram app on it, you can set up your Instagram profile as private directly from the app in question. Then, start the Instagram app on your Windows 10 PC by calling it from the Start menu (which you can open by clicking on the Windows logo in the lower left corner of the screen), log in to your account (if required) and then click on the little man symbol located at the bottom right of the Instagram window. In the screen that is proposed to you, click on the symbol (…) located at the top right to access the Instagram Options screen, then scroll through the list of options located in the box on the left and, finally, move the lever ON the left ‘switch located at the heading Private account (located in the Account section). I remind you that by setting your account as private, only the people you approve will become your followers and see your posts on Instagram. Your current followers, however, will not be affected by the change just made to your account. If you want to go back and make your Instagram account public again, go back to the Instagram Options screen (by clicking on the little man symbol and then clicking on the three dots located at the top right) and move the switch lever to OFF. placed near the heading Private account. Do you have a company Instagram profile and want to make it private? I’m sorry, but as clearly indicated on a Facebook support page (the company that actually owns Instagram), it’s currently not possible to make a corporate Instagram account private. The only solution you can take to make your Instagram profile private is to return to having a personal account and then make it private by following the steps I have indicated in the previous lines. Also in this case you will have to act directly from the Instagram app for Android or iOS (the Windows 10 app does not offer a specific function to return to the personal account). Procedure for Android – start the social network app on your Android device, log in to your account (if required), press the symbol of the little man at the bottom right, tap the symbol (⋮) located at the top on the right, scroll down to the Options screen, press the Return to Personal Account entry and confirm the operation by tapping the Go Back item in the box that opens. Procedure for iPhone – start the social network app on your iPhone, log in to your account (if necessary), tap on the symbol of the little man on the bottom right, press on the symbol (…) located at the top of right, scroll down the Options screen, presses the entry Return to personal account and confirm the operation by pressing on the item Return to the standard account from the box that appears. As soon as you have moved from your company account to your personal account, “Private” will appear in the Instagram Options screen as if by magic. So you can make your private profile simply by moving the appropriate switch ON, as I have amply illustrated in the previous paragraphs.